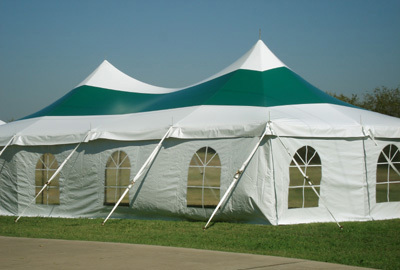 This high-tension tent will give your guests an elegant venue for your next event. The tent canopy is of heavy-duty 15-oz "Block Out" vinyl that is reinforced at the stress points, and has 2" seatbelt webbing to reinforce the entire perimeter. The 2" seatbelt ratchet straps are also included with the tent top. The package includes all the poles needed to erect this large tent, 42" stakes, and tent bags to store the vinyl top and the optional sidewalls, if ordered. You can get this tent in solid white or with a variety of horizontal colored stripes. A 1-year warranty applies to this tent.